"standard" data analysis software in social science, but also show them how they can test the delinquency theories and propositions covered in the reader, using current delinquency data packaged with the book. This absolutely unique feature is structured into fill-in-the-blank exercise sets that are easy to grade for large numbers of students by a single instructor. Over 150 very good questions have been put together for the readings so that instructors can easily test, even in large courses, whether or not their students are keeping up with the reading. A separate instructor's manual (with more tests) is also available. Joseph G. Weis is Professor of Sociology at the University of Washington. He served for a number of years as the Director of the National Center for the Assessment of Delinquent Behavior and Its Prevention, funded by the U.S. Department of Justice, as well as a member of the Washington State Governor's Juvenile Justice Advisory Committee. He is a past editor of the journal Criminology and a co-author, with Michael J. Hindelang and Travis Hirschi, of Measuring Delinquency. Robert D. Crutchfield is Professor and the Clarence and Elissa Schrag Fellow in the Department of Sociology at the University of Washington where he has been a winner of the university's Distinguished Teaching Award. He served on the Washington State Juvenile Sentencing Commission and is also a former juvenile probation officer, adult parole officer, and a deputy editor of Criminology. He is a past Vice President of the American Society of Criminology and currently serves on the National Academies' Committee on Law and Justice. His research focuses on labor markets and crime, and on racial and ethnic disparities in the administration of justice. George S. Bridges is the President of Whitman College in Walla Walla, Washington. He has served as a staff member of the policy office of the Attorney General of the United States as well as deputy editor of Criminology. He has been a member of the Washington State Minority and Justice Commission. He has published many papers on racial biases in American law and is co-editor, with Martha Myers, of Crime, Inequality, and Social Control. Assessing the Effects of School-Based Drug Education: A 6-Year Multilevel Analysis of Project D.A.R.E. 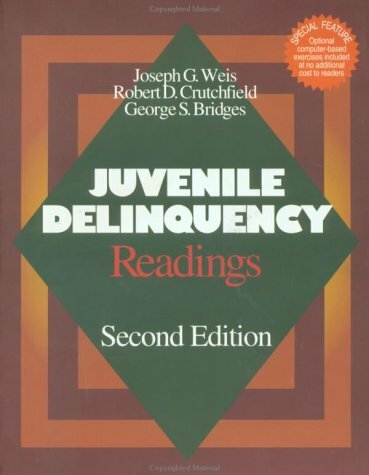 The Prevention of Serious Delinquency: What to Do?